Country Foot Care > FAQs > Diabetic Conditions > Can Diabetes Numb My Feet? Can Diabetes Numb My Feet? When you have diabetes, elevated glucose levels can damage nerves and result in numb feet. 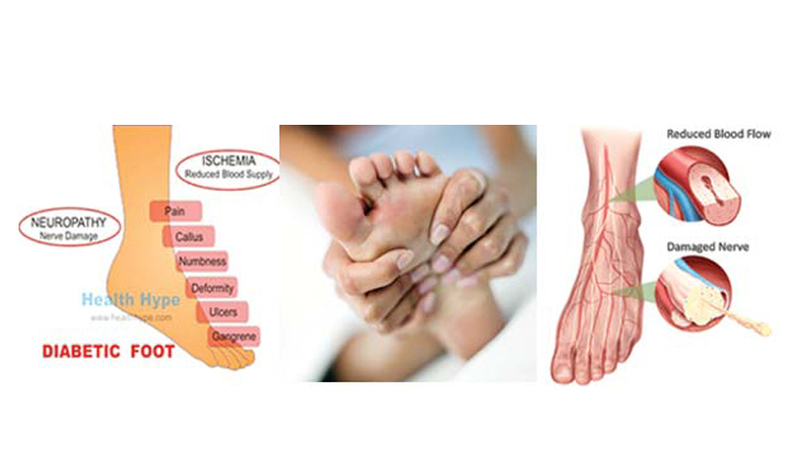 Called diabetic neuropathy, this loss of sensation can have serious consequences if ignored. You may acquire a blister or cut without even realizing it, and since poor circulation is also associated with the disease, your body will take longer to heal the wound. This leaves you susceptible to ulcers and dangerous infections. That is why it is so important to perform a diabetic self-foot exam every day. Also make sure to eat right, exercise, don’t smoke, and keep your blood sugar levels in check. If you have diabetes and are noticing that your feet are numb, we can help you to manage your neuropathy and keep your feet healthy and feeling good. Call Country Foot Care to make an appointment or you can also schedule an appointment online using the MAKE AN APPOINTMENT button at the top of this page.